Rudolph Bartholomew Meoli was born on May 1, 1951, in Troy, New York. 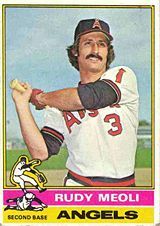 The five foot nine, left hand hitting infielder was drafted in the fourth round of the 1969 draft by the California Angels. 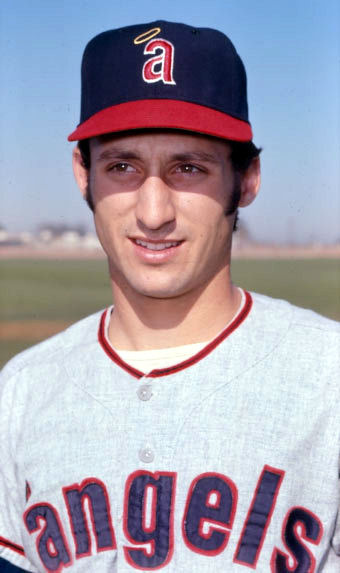 After playing in only seven games in 1971, he was given the Angels regular shortstop job in 1973. With the departure of Jim Fregosi to the New York Mets in 1972, five time All Star Leo Cardenas had taken over the position but was at the end of his career. 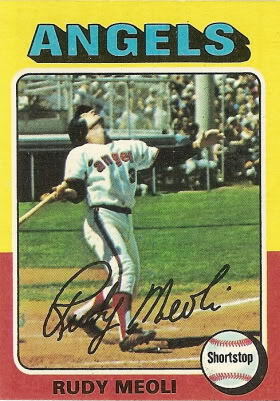 Meoli was suppose to be the future of the teams infield, but only hit .223 with two HRs 12 doubles & 23 RBIs (all career highs). He lost lost his job to Dave Chalk, who would have a fine career the next season. Nolan Ryan No Hitter: On May 15th, 1973 Meoli was in the lineup against the Kansas City Royals when Nolan Ryan pitched the first of his seven no hitters. Meoli made a fine over the shoulder catch off the bat of veteran; Gail Hopkins on a bloop to shallow left field. It was the closest thing to a hit the Royals had all day. Two months later, On July 28th he had his biggest day in the majors, driving in six runs including hitting an inside the park HR, in a 19-8 Angels rout against the Kansas City Royals. After batting only .214 in 1975 he was traded to the San Diego Padres for future Mets manager Bobby Valentine. Meoli was then quickly shipped to the Cincinnati Reds, in exchange for Merv Rettenmund right before Opening Day. He spent the next two years in the minors having his contract purchased by the Chicago Cubs in September 1977. Meoli hit just .103 in 47 games & then signed on with the Philadelphia Phillies the following season. There he played in just 30 games batting .178. Meoli's career was over after that year after six seasons. He was a lifetime .212 hitter with two HRs 20 doubles four triples & a .289 on base %. '75 Topps: The 1975 Topps Rudy Meoli baseball card was always a favorite of mine, Meoli is at the plate watching a towering pop fly he just hit above his own head, you almost get dizzy looking at the card. It seems the picture was taken prior to the 1973 season since the Angels did away with the classic lower case letter A after the 1972 season.